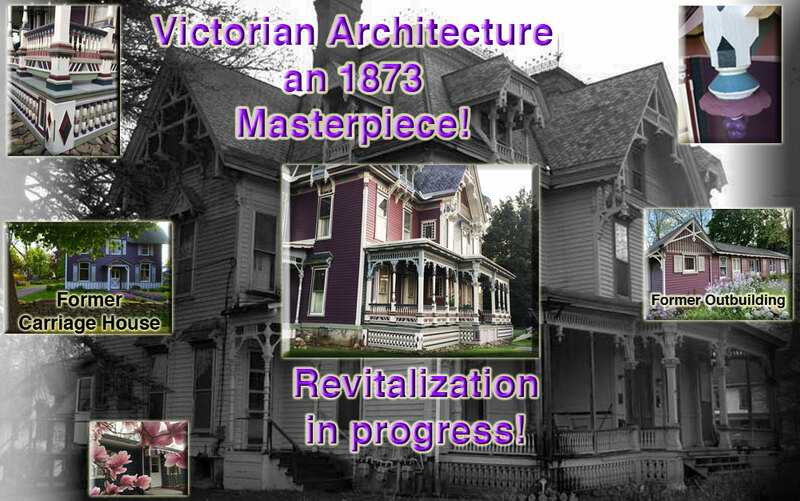 July 31, 2018 by Amy Zehr- (summary of my research, as of this date) - Revitalization In Progress Of One Of Waverly's Victorian Homes. We are the captivated owners of this Victorian, Eastlake and Gothic style, estate at 208 Chemung St. Waverly, NY. The "Zehr Estate" property consists of the main house at 208 Chemung street, the possibly former stables with later added on attached garages at 208 1/2 Chemung street, the former carriage house at 9 Athens street and the former site of an octagon two-family home which the original family used as rental income, at 7 Athens street. This estate, in the later half of the 1800's, was once home to one of Waverly's successful businessmen and "leader in the commercial life of Waverly," Samuel Wickham Slaughter. Prior to the Slaughter family owning the property, there was a blacksmith shop (pre- 1833) owned by Elder Aaron Jackson, on the current site of the main house. Also pre-1853 to 1877, there was an octagon home just to the west of the main house. The octagon home was purchased by Samuel Slaughter in 1877 and in 1879 he had it moved around the corner and below the hill to 7 Athens street, which at that time was also part of the estate, and remained so, until 1950, when Mary Fralick sold off part of the land to Mary Alamo, who had the current home at 7 Athens street built. Then, 67 years later, in January of 2017, we purchased 7 Athens street, rejoining the original property. Samuel Slaughter came to Waverly in 1857 with his father's family. They purchased the portion of the property where the main house stands and at that time, the home was much smaller and rectangular, which was sold to them by Thomas J. Brooks. When the Slaughter family came to Waverly, Dewitt Slaughter and his wife, Caroline, along with their children, Samuel and Antoinette, they all lived in the home. Dewitt Slaughter was a retired wealthy farmer from Hamptonburg, NY who served Waverly as a trustee in 1864. Samuel Slaughter married Charlotte Wells in 1873. The home was totally renovated into its "Eastlake" and heavily ornamented design that remains today, except for an open back porch much like the front porch, which was taken off around 1945, after the property was sold off by the original family. Local rumors and information handed down by previous owners is that Dewitt Slaughter had the home "rebuilt" in 1873 for his son, Samuel, as a wedding gift. A newspaper clipping verifies that the home was "rebuilt" in 1873. Samuel and Charlotte had one daughter, Mary Gertrude Slaughter, born in 1890. Mary later went by her middle name, Gertrude. On Feb. 2, 1915, Gertrude married George Brinker Knapp, son of Joseph Warren Knapp and Frances E. Durkee Knapp, proprietors at that time of J. W. Knapp & Son on the corner of Broad and Fulton streets in Waverly. George and Gertrude had one daughter, Charlotte Slaughter Knapp born in 1916. The home was occupied by four generations of this Slaughter/Knapp family for about 88 years. Then in 1945, Gertrude Slaughter Knapp sold it to Mary I. Fralick who turned it into an apartment complex. Mary Fralick and her first husband, Loren Pierce, had operated the Marilorn Motel (named after parts of each of their names) in Waverly for several years. Mary Fralick later moved to Florida with her second husband, Ralph Fralick. The estate had been used as apartments for 65 years, until we purchased it from my Dad, Richard Morris, in 2010. We are asked quite frequently what we plan to do with the property when we are finished with the restoration. We are considering numerous possibilities such as guided tours, rental space for small-scale special events, gatherings and meetings, special theme educational/hobby getaways, teas, and short term rental stays. At this point in time, the future of Zehr Estate's possibilities are endless. For now and the next several years, we will continue with the restoration/revitalization process. Samuel Wickham Slaughter was a druggist and owned and operated the former "Corner Drug Store", corner of Waverly and Broad street, for more than 30 years. John C. Vanatta rented the building from Charlotte Wells Slaughter. Earl Payne later rented it from Gertrude Slaughter Knapp. In 1946, Gertrude Slaughter Knapp sold the building to Earl Payne. Samuel Slaughter was a member of a Waverly debating society called "Societias Philalogo." Samuel was also vice president of the Citizen's Bank of Waverly from its organization in 1874 until his death in 1894. At the time of his death, he was also director of the Citizen's Bank. He was a stock holder in the Waverly Water Works and the vice-president of the Waverly Water Company in 1880. Samuel Slaughter was also a director for the Hall & Lyons furniture company. He was a member of the Tioga hose company. For many years, he was a member on the board of trustees for the Waverly Presbyterian Church. Charlotte Wells Slaughter was an active community member in Waverly and other nearby communities. She was involved with the; Waverly Presbyterian church, Susquehanna Valley Home (state orphanage), Tioga Chapter D. A. R. in Athens, PA, and ladies' auxiliary of the People's Hospital. She loved to entertain. When Mrs. Samuel W. Slaughter wasn't entertaining in her home, she was helping her friends entertain in their homes. Many gatherings took place in the main house; musical events, bridge parties, Daughters of American Revolution Colonial Tea, reading circles, and social gatherings. She passed away in 1912. Gertrude Slaughter Knapp also loved to entertain and did so frequently in the home, hosting parties and dances, and assisting her friends when they entertained. She too, was involved in the community. She was active with; the Waverly Presbyterian church, a dancing club, People's Hospital (treasurer), raising money for the Tioga General Hospital, Girl Scouts (president of committee meeting in 1933 and Scout Commissioner in 1934), the Tioga Health Unit (Executive Committee member in 1944 and elected director for 3 years in 1950), and Shepard Hills Country Club, being a member. She passed away in 1956. George Brinker Knapp at one time; managed a farm and milk business, was an engineer at Wellington near Seattle, Washington, was a member of the Valley View Country Club and the Shepard Hill's Country Club, was a stock holder of the Citizens' Bank in Waverly, and was secretary-treasurer of the Finger Lakes Golf Association in 1924. He passed away in 1927. Charlotte Slaughter Knapp graduated from Cornell University in 1938. She passed away in 1985 in Los Angeles, CA. The designer and builder of the estate was Azariah J. VanAtta. He was an active person in Waverly for many years. He was a carpenter, architect, and contractor. A. J. VanAtta also designed and built other former Waverly buildings; the Shipman building, which was destroyed by fire in 1871, the Merriam block on the corner of Waverly and Broad streets, the building occupied by Simon Zausmer which in 1892 was a jewelry store, the town clock block which burned, the Methodist Episcopal Church, the old Baptist Church, and the Water Works plant. He also was superintendent of the Waverly Water Works. In 1871, he was master of the Waverly Lodge, No. 407, F. & A. M. Mr. VanAtta was a member of St. Omer's Commandery Knights Templar, of Elmira. He passed away in 1913. We ask that anyone with; knowledge, pictures, or any type of additional information on the estate, octagon home, architect/builder and VanAtta family, or Slaughter/Knapp family, to contact us. If you are interested in Waverly, NY history, please check out the Waverly Historical Society.